(MoneyWatch) Windows 8 is without a doubt the most controversial OS that Microsoft has ever released. It's not objectively bad in the same way as Windows ME or Windows Vista; instead, it's reviled by many for its tablet-like interface, even on desktop PCs, and schizophrenic interface that splits you between the windows, multi-tasking desktop and the mono-task modern screen. Well, good news for anyone who wants to leverage the best bits of Windows 8 without the frustrations... or who simply has no choice but to upgrade with a new PC. Stardock has just released ModernMix, a program that lets you run modern apps in resizable windows on the traditional desktop. 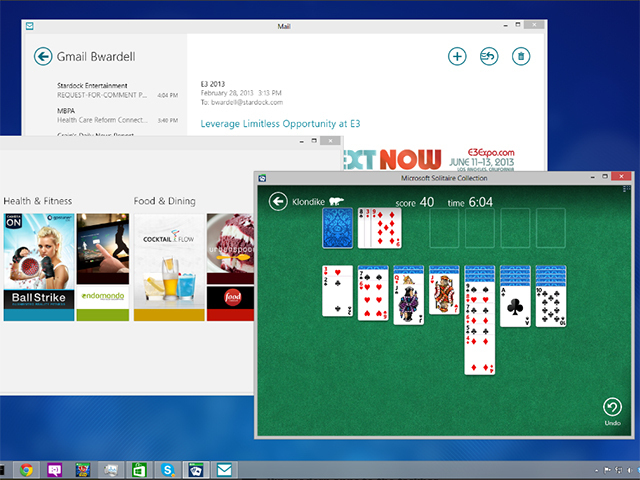 In other words -- and I can't believe I have to say this in 2013 -- ModernMix lets you multi-task apps in Windows. Say goodbye to full-screen-only modern apps. Windows 8: Revolution or disaster? Stardock has a great reputation for releasing utilities that improve on basic Windows features. Start8, for example, is an excellent program that restores the old Start menu to Windows 8, while Fences lets you create structured groups of icons on the desktop, sort of like invisible folders. (Fences, by the way, is one of my favorite programs, ever.) ModernMix, on the other hand, solves the second biggest gripe with Windows 8 (second to the lack of a Start menu) by converting modern apps to run on the desktop. ModernMix isn't especially complicated; the app lets you choose whether modern apps will run full screen or in a window, and once on your desktop, modern apps work like any old program, complete with full multitasking, a minimize button, and a close button. You can also pin modern apps to the taskbar, just like traditional Windows programs. And it works like a charm. You can try ModernMix for free for 30 days, or buy it for $5.